Ignite your retail profits with Campfire FX, Canada's leading Campfire Colorant! Simply place an entire, sealed package of Campfire FX on your fire and watch the magic begin! Within two minutes, your fire will be a mesmerizing display of brilliant purple, green, and blue flames. Best of all, your campfire fun will last for up to 30 minutes per use! Campfire FX is proud to introduce the Campfire FX 3-Pack. Each 3-Pack contains three single-use Campfire FX packages. Campfire FX 3-Packs are the perfect addition to a weekend camping trip! "My family and I took a weekend vacation to the Whiteshell. We brought along a couple packs of Campfire FX and we were not disappointed!" Campfire FX 3-Packs Now Available! Fires colored with Campfire FX will mesmerize audiences with dancing purple, green and blue flames! One packet will color your fire with magical colors for up to 30 minutes! 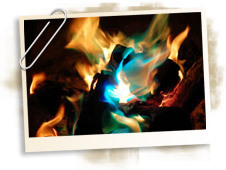 Campfire FX is a fire colorant that is safe to use on any wood-burning fire. The best way to color campfire flames while camping is to place Campfire FX on a high point at the center of your fire. The 2.5 inch by 4.25 inch packets are distributed to retail outlets in Point of Sale Cartons containing 50 units each. Campfire FX is manufactured and distributed by BLAST-OFF Fireworks in Selkirk, Manitoba, Canada. Click here for more information on BLAST-OFF fireworks.